Tell me the facts and I'll learn.Tell me the truth and I'll believe. But tell me the story and it will live in my heart forever." Storytelling is the most powerful way to put ideas into the world today. To unveil this intangible fascinating heritage, students of Grade 3-5 at Witty International School attended the International Story Telling Festival" Udaipur Tales". They witnessed various narrative styles and listened to mesmerizing stories narrated by storytellers from various parts of world .They narrated stories like 'A Pumpkin who married the Princess, Gajapati- Kulapati and Old folk tales by Jeevaji Raghunath.' The genre of tales ranged from fact to fiction. 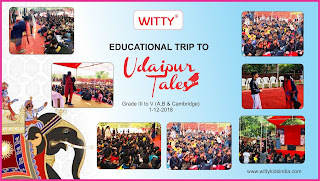 Students enjoyed being a part of Udaipur Tales.